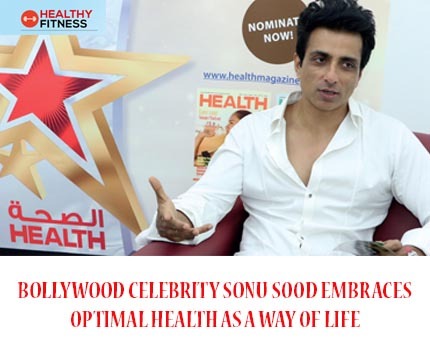 A man with fitness and optimal wellness strongly engrained in his persona, famed Bollywood actor Sonu Sood talks about the upcoming HEALTH Awards and its importance in optimal health and wellbeing. I think the HEALTH Awards are a fantastic initiative, especially in a time where we are all running around with so many things to do and in the process; unfortunately, many people are neglecting their health. The annual HEALTH Awards are a great initiative to bring awareness to the table. I think we really need awards like these; to guide you towards the best of the best; to motivate all of us into paying attention to our health and in turn, taking better care of ourselves and motivating others to do the same. In this and age, all of us have that certain person who inspires us to work hard, achieve our goals, and aspire us to be our best. Therefore, when it is recognized officially as is the case with the HEALTH Awards, I think it motivates others to follow in these footsteps and reach their goals even more so. I think the annual HEALTH Awards are a very good move; all of these awards, be it for Bollywood or health, I think are a fantastic initiative. I think these days there are two kinds of people; one who is already into fitness and one who aspires to be into fitness. These days, everyone is getting fit and working towards being healthy. Some achieve it and others struggle with it, so when you have awards like these, especially related to wellness and fitness, strong messages of achievement and inspiration towards excellence are sent out very clearly. And since it’s going to be an annual and regular event conducted by Thumbay Group, it is a wonderful initiative. In fact, I think once the HEALTH Awards has taken place, it will a key defining benchmark in the health and wellness sectors followed by many others in the future. I recently did a movie with Jackie Chan who would always tell me that he had never thought before that Indians could be such fit people. I never became an actor and then afterwards, worked on getting a 6- pack for a movie just for that role. For me, fitness is a strong way of life and always has been. It is a lifelong commitment and should be part of everyone’s life; not just actors and celebrities but doctors, businessmen, students, and shopkeepers. We all have to aspire to be our healthiest and most optimally fit. I always say that fitness for me is as routine and normal as brushing my teeth. It is engrained into my lifestyle and daily life. Despite the fact I hail from Punjab, India, where rich food is the norm, I have now witnessed a slow change in that region also whereby the younger generation especially is eating healthier and working on their fitness and lifestyle. But yes, like any Punjabi, I love my share of parathas and other delicious Punjabi foods. Still, I aim to eat more salads and watch my food intake. I have a good share of very healthy foods with the occasional indulgence now and then. I always advise people that fitness is something you must religiously follow and adhere to. But remember, it must be enjoyed and something you look forward to. It needs to come from within. Social media is bigger than big. It’s huge and now everyone is into it. Be it Facebook, Instagram or Twitter. Celebrities in particular are provided a strong platform of influence and I think if I can influence the mindset of a few people, then I feel quite good about that.